Introduce students to ancient civilizations with these lavishly illustrated, large-format books. An overview of each civilization includes its history, government, art and architecture, language, mythology, and even aspects of everyday life. Each volume has a chronology and short biography of key historical figures. This series meets middle school world history standards. 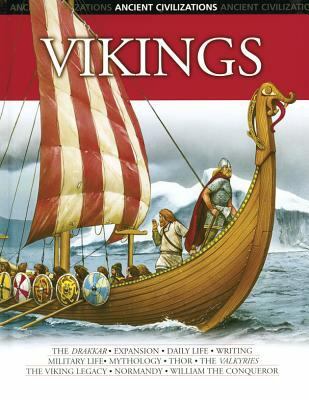 The Vikings were a bold and experienced seafaring people whose incursions in search of land and riches kept the coasts of Europe on edge for two centuries. They were well-skilled merchants and the first European group to set off on long voyages of geographic discovery.Gassos, Dolores is the author of 'Vikings ', published 2005 under ISBN 9780791084908 and ISBN 0791084906. Loading marketplace prices 6 copies from $4.79 How does the rental process work?